A lot of you have asked me what to do with the byproduct of making biodiesel - glycerin. 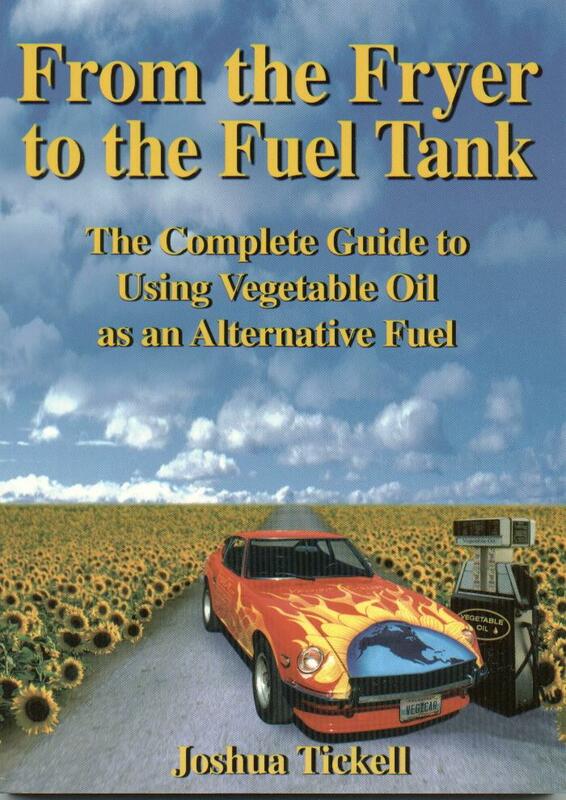 Following is an excerpt from a biodiesel book which is full of great information like this... From the Fryer to the Fuel Tank . We have this book available in eBook format with instant download. Just CLICK HERE for all the details! The glycerin byproduct from a biodiesel reaction will contain almost 100% of the catalyst used in the biodiesel reaction. Therefore, the glycerin and lye or KOH have already formed soap by the time the glycerin is drained from the biodiesel reaction container. The liquid or gelatinous glycerin soap is good for cleaning greasy hands or equipment. During the biodiesel reaction, some unreacted alcohol will fall into the glycerin. To make the glycerin into a nice hand soap, the glycerin must be heated past the boiling point of the alcohol used in the biodiesel reaction. This will cause the alcohol to evaporate, leaving only glycerin soap. If you used methanol in the biodiesel reaction, heat the glycerin past 148 deg F (65 deg C). If you used ethanol in the biodiesel reaction, heat the glycerin past 175 deg F (79 deg C). Do this in a well ventilated area in an open container and do not breathe the fumes. Allow the glycerin to stay heated for at least 10 minutes and then allow the glycerin to cool. Essential oils and fragrances can be added to the liquid glycerin soap to enhance its smell. For each liter of glycerin, add 150 milliliters of manufactured fragrance oil or 50 milliliters of essential oil. In addition, you can add up to 300 grams of herbal powder and/or 300 grams of dried flower. The glycerin soap will usually be brown, but its color can be slightly altered by adding artificial colorants. Heat the glycerin in a pot until it liquefies. If the glycerin came from dirty used cooking oil and it contains some food particles, filter the glycerin by heating it and pouring it through a mesh screen or some pantyhose. Pour in the fragrance oil, herbal powder, and dried flowers while the glycerin is in a liquid state. Stir lightly to evenly distribute the ingredients. Pour the glycerin into a plastic container and allow it to cool. Let the soap sit in the open air for a week. The resulting liquid soap should be mild and pleasant smelling. By adding more lye or KOH to the glycerin soap, the soap can be hardened and its lather will increase. In order to make the glycerin into hard soap, first evaporate the alcohol as described for liquid glycerin soap. Fragrances can also be added to the glycerin as described for liquid glycerin soap. Next, divide the total number of grams of catalyst used in the biodiesel reaction by the number of liters of glycerin. For example, if a biodiesel reaction used 100 grams of lye and the reaction produced 4 liters of glycerin, you would divide 100 by 4 = 25. We will call this number (C) and it will represent the amount of catalyst in each liter of glycerin. If you used lye as the catalyst, subtract (C) from 70 grams. We will call this number (L). Following the example, you would subtract (C) from 70 grams to get (L) = 45. Now multiply (L) times the number of liters of glycerin produced during the biodiesel reaction. This is the total number of grams of lye you will need to add to make your glycerin into hard soap. In our example, (L) x 4 liters of glycerin = 180 grams of lye. If you used KOH as the catalyst instead of lye, use the same formula, but subtract (C) from 100 grams. This number will be (K). Multiply (K) times the number of liters of glycerin produced during the biodiesel reaction. This is the total number of grams of KOH you will need to add to make your glycerin into hard soap. Next, multiply the number of liters of glycerin times 340 milliliters. For example, if you have 4 liters of glycerin, multiply 4 x 340 milliliters = 1,360 milliliters or 1.36 liters. We will call this number (W) and it will represent the amount of water to use. Pour (W) milliliters of water into a pyrex, iron, or enamel cooking pot. Bring the water to 90 deg F (32 deg C). Slowly add (L) grams of lye or (K) grams of KOH to the water and stir the catalyst until it is dissolved. Keep the catalyst/water at 90 deg F (32 deg C). Wear gloves and protective clothing. In a separate, large pot, bring the glycerin from your biodiesel reaction to 110 deg F (43 deg C). Pour the catalyst/water solution into the glycerin in a thin, slow stream. Continue to heat the mixture of glycerin, catalyst, and water as you stir slowly and evenly for 10-20 minutes or until the mixture begins to thicken. When the mixture thickens, pour the still warm mixture into a thick cardboard or wooden box or other container which has been lined with a damp cotton cloth. The cotton cloth should be soaked in water, wrung almost dry, and then placed in the box. Put the box in a pan in case it leaks. Once the soap mixture has been poured into the box with the cotton cloth, put a board on top of the box. Then put an old blanket or rug on top of the box to keep the heat in. Leave the box for 24 hours. Remove the block of soap by pulling the sides of the cloth out of the box. Once the block of soap has been removed, it can be cut into smaller blocks. Allow the blocks of soap to sit in the open air for 2-4 weeks before using them. Since each batch of glycerin produced during the biodiesel reaction is different, each batch of glycerin soap will also be different. You can experiment with more or less catalyst and water to change the consistency and lather of the soap.